The trope of the tortured artist came to life at Emerson last week as Signe Baumane used her drawing and animation talents to start a humorous conversation about mental illnesses. Baumane, 50, is an award-winning animator and the creator of the film Rocks in my Pockets. The film, which was screened on March 26 as part of Emerson’s Bright Lights series, tells the true story of Baumane’s Latvian family’s mental history. It includes stories of suicide and schizophrenia and her own account of manic depression, told entirely through her original artwork and narration. She uses a combination of drawings, digital animations, and papier-mache to tell the story. Despite the film’s focus on her Latvian family, Baumane said the fight to destroy the stigma around mental illness is universal. Following their society’s norms, her own family was too ashamed to share the secrets of her DNA even to her, which she discusses in the film. It took her years of research to find enough information for an hour-and-a-half movie. She finally found out during a drunk conversation with a half-relative. Senior Hailey Chavez, one of approximately 70 people in the audience, was required to attend as a part of her Animation Histories class, but said she ended up enjoying herself. Her professor, Janeann Dill, helped plan the screening and introduced Baumane at the event. To keep the story personable and “candid,” Baumane narrated the film herself. Because of her strong connection to the storyline, Baumane said, in the Q&A, that she felt she was the most qualified and sincere. Baumane’s own story is one of bipolar ups and downs, mental institutions, and antidepressants. She said that currently, she gets depressed to the point of having suicidal thoughts about twice a year, but can usually feel when it’s coming on. After a bad experience with medicine and seeing what it did to other patients in mental institutions, she no longer takes drugs, but still encourages anyone struggling to consider pharmaceuticals. She said during the Q&A that she originally conceived of the project as a dark comedy about how she would not kill herself, in which she would compare different methods of suicide and why each one was dissatisfying to her needs. For example, she said with a laugh, one must be considerate to others when contemplating suicide and not ruin days by jumping in front of subways or cars. But as she wrote those explanations, she felt she needed to explain her own illness first. From there, it evolved into the film it is today. In a similar vein to her original idea, the movie opens with her grandmother’s first few failed attempts at drowning herself; Baumane then says she would have instead put rocks in her pockets, the inspiration for the title. 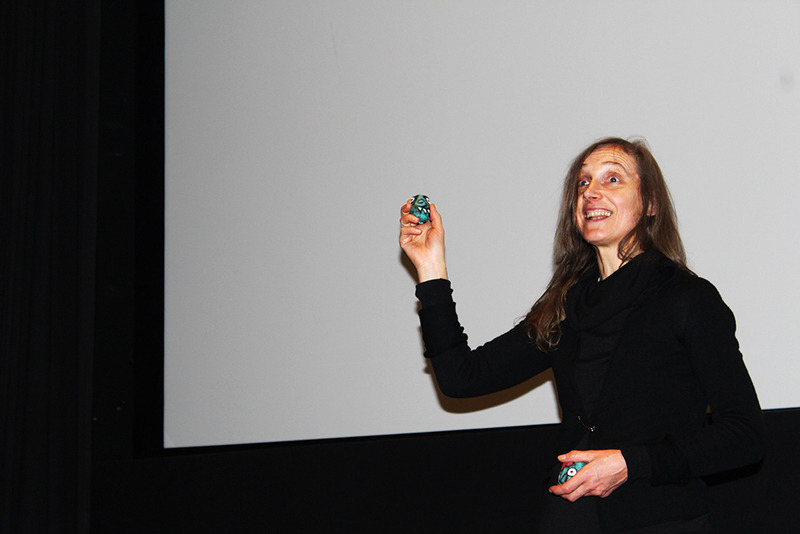 The theme of rocks came full circle after the screening when Baumane threw three papier-mache rocks into the audience for, as she said, good luck in love. She also gave away drawings from the film and a movie poster to a woman who said she traveled from the University of Massachusetts Dartmouth just to see her. The event returned to a serious tone when an audience member asked Baumane what her family thought about the movie. She said initially it wasn’t going to be screened in Latvia to protect her family’s confidentiality, but after hearing an outcry in the country and receiving a grant, she released it there. Many of her older relatives were so aghast at her disclosure of long-kept family secrets that they ended all contact with her. Baumane said it was worth it, though, when her younger relatives thanked her for explaining to them the root of their mental disorders, learning that they’re not alone. The film was nominated by Latvia as its entry for the best foreign-language category at the Oscars.